Roman Chamomile is also referred to as "plant's physician" because it offers so many medicinal benefits not only to humans and animals, but also to the plants surrounding it. Its healing qualities seem to be radiating. The Romans have been using this oil since the ancient times because it gives them the sense of courage and peace of mind. It is believed to affect the mood, emotions, and treats the skin well. 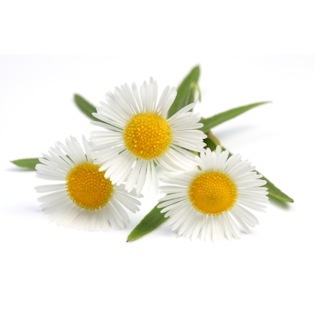 Chamomile is also popularly used to have a restful sleep in case of insomnia. Add 1-2 drops to your preferred moisturizing lotion, shampoo, or conditioner to enhance healthy hair and supple skin. Add 1-2 drops to green tea or hot beverages to calm the mind and body. Diffuse Roman Chamomile oil or massage to soles of feet at bed time for a good night’s sleep. To maintain natural moisture on skin and prevent premature aging, add roman chamomile essential oil to your lotion or coconut oil. Combine 2 tsp. Roman Chamomile and Lavender essential oils with 8 oz. of baking soda, 4 oz. of citric acid, 4 oz. of corn starch, 4 oz. of Epsom salts, 3/4 tsp. of water, and 2.5 tsp. almond oil to make a bath bomb. Press into mold then let dry for 24 hours. You can also make a "sleepy time spray" by combining 10 drops each of Roman Chamomile and Lavender oils, witch hazel, and 5 drops Wild Orange essential oils in a spray bottle. Spray on bed sheets before going to bed. To make a soothing balm, mix 1/2 cup coconut oil with 1/4 cup beeswax and heat. While cooling, add 15 drops each of Roman Chamomile and Lavender essential oils. Roman Chamomile oil fuses well with oils of Bergamot, Lavender, Clary Sage, Jasmine, Grapefruit, Geranium, Tea Tree, Lemon, Rose, Ylang-Ylang, and Lime. Get Your Roman Chamomile Essential Oil Now! I've been using this as a defuser smell in my home to help minimize allergy reactions. Its been working well! My husband sneezes a lot, and he hasn't sneezed or had crazy reactions for awhile now. I sometimes mix it with frankincense which is another one good for allergies and immune system.